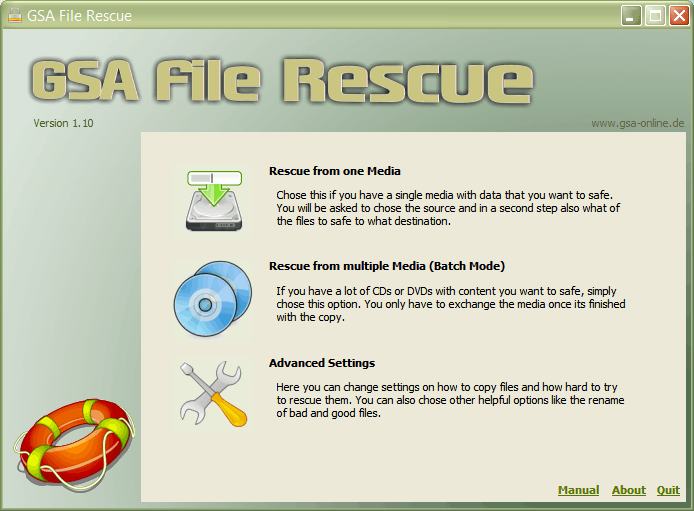 GSA File Rescue saves your data from unreadable CDs, DVDs or other Media and lets you open them again. We often store important files on media like floppy disks or CDs. Unfortunately, the saved data usually gets lost sooner or later due to aging media or damage. Don't lose what's important to you. Use GSA File Rescue to store the data on a safe place and safe as much as possible. You will even be able to use the "Batch Mode" that can operate without a single mouse click. You simply insert the media, wait till the program is ready with the job and ejects the CD/DVD. Then you simply insert a new media and it continues. This data recovery solution is fully configurable to your needs. It is safe and risk free as no data on the original drive is modified. As much as possible data is rescued.